Atlanta Moonwalks - For children under 12, this has been the number one requested inflatable game rental. We carry the Deluxe Castle. Atlanta metro area delivery is free. These moonwalks have a shade cover on top, and the dimensions are 15’ x 15 ‘. The ceiling height is 12 feet. Children, up to 120 lbs, must climb up an inflatable step to get into the unit. One dedicated electrical outlet is needed. Also, the unit must be within 100 feet of an electrical outlet. May be used indoors or outside. 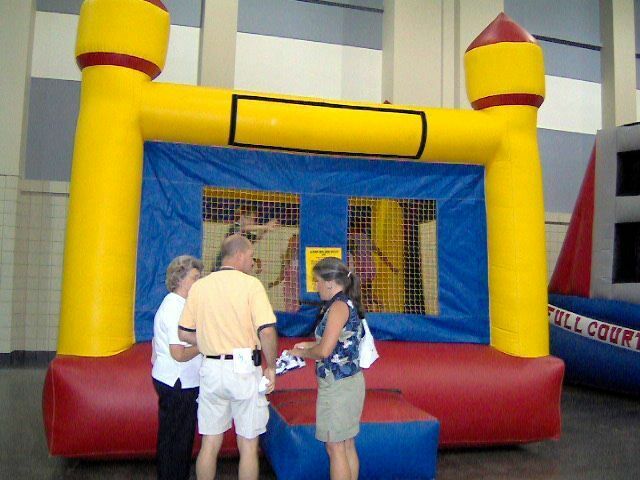 The sides of this inflatable game are netting, so you may watch the children bounce and laugh.